Making any major lifestyle adjustment takes time, courage and willingness to grow, but it comes with a long-lasting positive impact. Changing your eating habits and following a primarily raw, plant-based diet, for example, is one of the most health-conscious decisions you can make. Not only does it fuel your body properly, detox your system and promote longevity, but it can also fulfill the desire to look and feel better as you age. It can seem difficult to make such a serious lifestyle change if your life revolves around a hectic family schedule – especially since a good amount of preparation goes into this diet. If you make use of our valuable resources, however, like our free Get Started Guide and the Getting Started on the Hallelujah Diet DVD set, making these new adjustments can be simple and seamless. With our Get Started Guide, we’ll show you how to replace foods and recreate some of your favorite dishes. We’ll also show you what a typical day on the Hallelujah Diet looks like if you have absolutely no idea how to get started. In the DVD set, you’ll learn tips for incorporating healthy eating into a busy life, how to save time and money with meal preparation, advice for dining out and so much more! 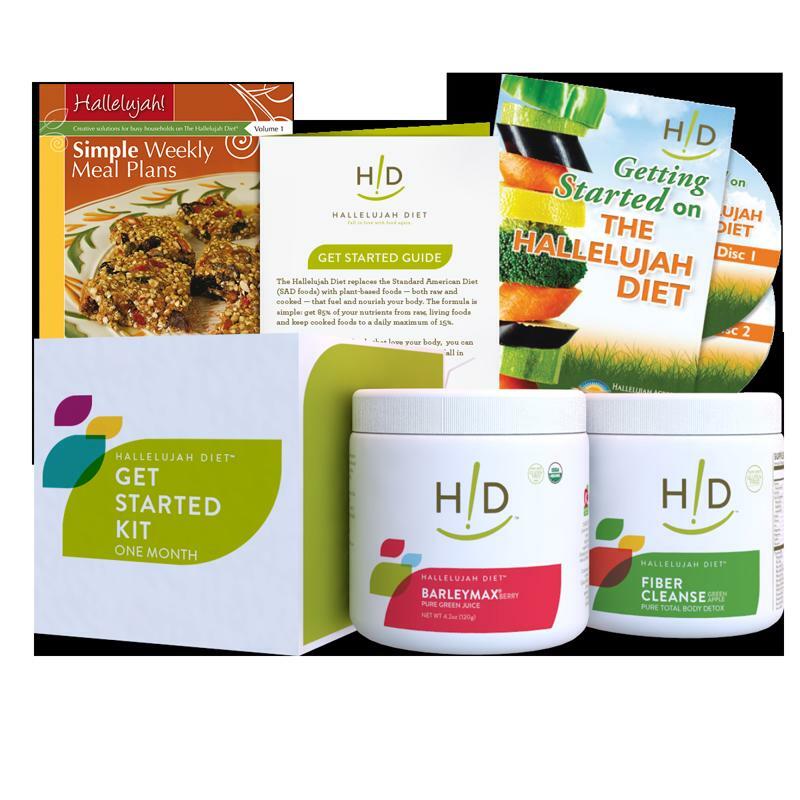 Let our Get Started Kit get you on the right track to optimal health. Start Juicing – Every Day! Don’t feel overwhelmed by the amount of fruits and vegetables you should be eating. Instead, try juicing once a day! Or save time by juicing every other day and make enough for the second day. It makes a delicious treat and it’s the greatest way to absorb maximum nutrients almost instantly. Turn to our collection of juice recipes for inspiration in the kitchen! Cutting your old eating habits cold turkey – no pun intended – can be difficult to shake. If you find a way to keep your mind distracted, however, you’ll stop thinking about the foods you used to consume and focus forward on optimal health. Find a new hobby the whole family loves and make time for each other a few times a week to stay busy. Remember: Following the Hallelujah Diet is certainly about prioritizing wholesome foods, but you should implement natural supplements into your regimen as well. Our Get Started Kit is the perfect introductory set of products to try as you begin your journey to better health. It includes our best-selling products BarleyMax and Fiber Cleanse, plus a recipe book and the Getting Started on the Hallelujah Diet DVD Set. Let us help you make gradual changes to your lifestyle by helping you improve your overall health with pure nutrition. The beginning stages of any transition are the most challenging. It’s good that there are resources out there to offer support and guidance during this new adventure. The Getting Started On The Hallelujah Diet DVD set is a really good tool for beginners. It is pretty thorough at covering the basics about the diet and lifestyle and a typical day on the diet. This is great advice! I think simplifying the first steps of changing to a healthier lifestyle is the best way to stick with it and not get discouraged. Just take it one step at a time and you will make it! PLS I NEED PRODUCTS THAT LL CURE COMPLETE STROKE. Hallelujah Diet cannot tell you how to heal from a stroke. Did you know that that Rev. George Malkmus had a stroke? Here is his story.